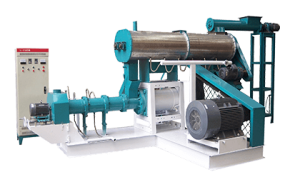 Manufacturers are keeping exploring more advanced fish feed pellet machine and production technology to satisfy customers’ increasing demands for high-quality and nutritionally-balanced sinking & floating fish feed. 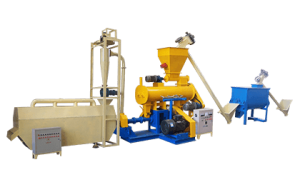 The early fish feed equipment cannot satisfy current production needs any more, so Fanway Fish Feed Machinery has worked out low-energy-consumption fish feed production plant and fish feed pellet machines with multiple production models. Floating fish feed plant is applicable to produce feed pellets for pet, ornamental fish, pond-fish, and marine fish, such as catfish, shrimps, crab etc. According to the nutritional requirements of different fish species, consumers can readjust the process, add different raw materials and manufacture a variety of fish feeds with different particle sizes and properties of floating-up. Fish feed pellets, produced after high temperature and high pressure, pollute less in the feeding process, which makes Fanway Fish Feed Pellet Line the most ideal facility. ① Helical elevator: Equipped with helical vanes, made of carbon steel plate. It is mainly used for conveying powder, granular and small-block materials, chemicals, etc., unsuitable to transport perishable & sticky materials. ② Stock bin: quadrangular loading hopper, with a viewing port, internal material-level is in sight. The chamber body is made of 2mm carbonplate. ③ Bag filter: bag size (mm)-1000×610×50. Filtration area:12.38 square meter. Automatic dust filtration, pulse-solenoid, including 4kW fan. ④ Droplet fish feed crusher: Processing capacity:2.0-2.5T/H, power:22kW, screen mesh has sieve disk with 1mm hole. 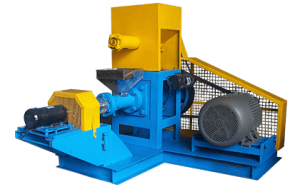 The crushing chamber can realize the idealized water drop type and the unique air inlet mode, avoid the circulation phenomenon during the crushing process. The bottom of the crushing chamber is provided with a “U” type of secondary combat tank, which greatly improves the output. The full open type operation door starts quickly, with the elastic press screening mechanism, is convenient to maintenance and change screen. The rotor, after checking by accurate dynamic balancing, ensured that the operation is more stable, less noise, better performance. ⑤ Chain bucket elevator: Granules material:2-3T/H, powder material:1-2T/H, the head and tail of the machine is 3.5mm carbon steel plate, power is 2.2kw, head cover is 2mm carbon steel plate, straight tube is 2mm carbon steel plate, poly propylene ethylene bucket and brute force bucket belt, the tail has a belt tensioning device, and the head has venting holes, there are 4 buckets per meter, transmission is chain. ⑥ Fish feed mixer: Mixer capacity:500kg/10-15min. It‘s characterized by advanced technology & reliable performance. Power:7.5-11kW, carbon steel plate material. ⑦ Dry type fish feed extruder: Application of parted type, sleeve of bulking machine is easy to tear down and change parts. When the machine is in wear condition, it only needs to change barrel liners. Spiral is in segmentation structure. Due to different abrasion loss, it just needs to change the structure of wear. To do die with different diameter and forms, change different themes accordingly. When products are manufactured, we offer three dies for free. You can choose any three dies according to your demand. Diffusion knife is with the soft edge so that it fits tightly around dies. What’s more, this kind of knife does not readily leave rough edge and waste. Using frequency control, the cutting motor can control the length of blanking by adjusting the revolving speed of diffusion knife. Equipped with frequency feeding device in control cabinet, it can adjust feeding speed. Power of main motor is 9.0 kW; the feeding machine, 1.1kW and the cutting motor, 4.0kW. In addition, it increases cooling machinery for cycle oil in bearing box. Therefore, it can not lead to high temperature, which prolongs the service life of bearings. ⑧ Pneumatic conveyor: It is collectively known as pneumatic tube conveyor, welded together by carbon steel plate. Fix unloader and chakroun into the next connected machinery. Granulated fertilizer is dropped into feed inlet from bulking machine. The granulated fertilizer is sent to chakroun through negative pressure produced by high pressure fan, and then the fertilizer is equably delivered to the next machinery by unloader. The equipment is characterized by small occupation and easy mobility. If heightening and refitting are required, it can be achieved by changing the pipe length. The customers can complete the operation without help from anyone else. In the meanwhile, the machine can maintain the shape of fertilizer without dust. ⑨ Mesh-belt Type fish feed dryer: The dryer machine often applies in drying maters, when material via belt conveyor transported into dry tunnels, hot air will soon touch them and dry them. It generally consists of many interdependent units, each of that includes cycling fans, heating equipment, independent or public air in system and tail gas out system. To optimally dry materials, operating parameters of temperature and moisture of dry medium and the cycling account can be controlled dependently. In general, the dryer machine is made up of one cycling belt conveyor, two or more air heating equipment, a few of fans and variable speed drive. The belt conveyor is made up of stainless steel screen or porous stainless steel, driving by motor and adjustment in revolving speed. Features: this equipment is simple structure and comfortable installation and maintenance. In the drying process, damage is free of shocking and striking. Frame is weld of channel, angle iron and carbon steel, insulation sandwich in it, with electric heating equipment as the heat source to prevent heat loss. Mainly used in the process of cooling granular feeds in large and middle sizes feed mills ,to easily transport,storage and save, SKLN contraflow cooler cools granules with temperature 60-80 degrees and moisture 13-15 % from front dryer down to little higher than room temperate and moisture 12-13%. SKLN contraflow cooler consists of feed-in part, bracket shell and feed-out part, with reasonable cooling truth and application of Internationale advanced technology. Machine capacity is big to meet different demands of output by adjusting the position of level indicator. The discharge part is pneumatic,electric or free of vibration. The cooling chamber is made up of tampered screen. According to different models, cooling ares in it is about 6-8 in average. There are much cool air mutually circulating among cooling ares to quickly and efficiently produce the best production. It is the best ideal cooler in China, with sample structure, reasonable layout, comfortable dismantlement, lower energy consumption, high automation and efficient production. ⑪ Cyclone: it is connected with cooler machine, with fan equipped upside, discharging port below. It is used to collect detrital grain and dust in ventilation process. ◇ Fanway floating fish feed plant adopts double-screw extruding technique. The fish feed pellet manufacturing process, from raw materials crushing to finished products packaging, an be finished at one time. This 1-1.2 T/H floating fish feed plant is for your reference only. Engineers and sales persons will specially design for you in accordance with your raw materials, self construction of factory building and capital budget.